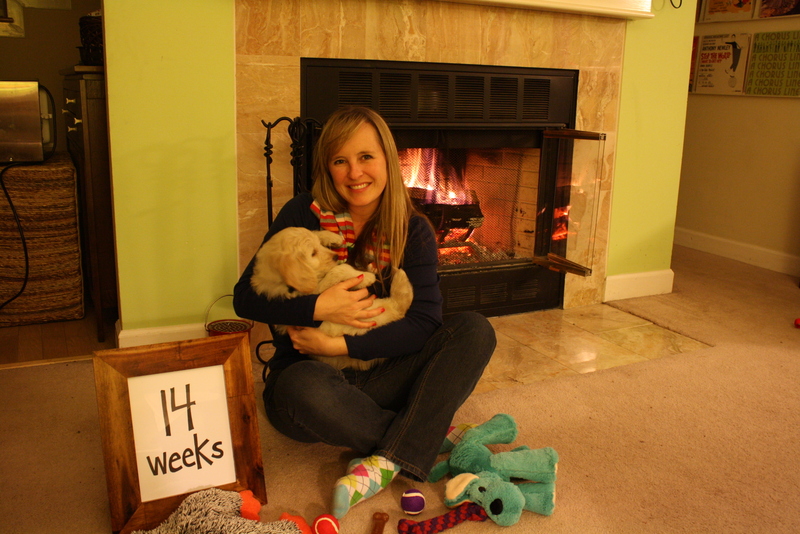 14 weeks: We got a dog. We visited the goldendoodle breeder at her home on Sunday evening and met an adorable little cream colored puppy who was available for adoption and he stole our hearts. We played with him for 2 hours asking the breeder TONS of questions and also trying to estimate how crazy we were to be bringing home a puppy 6 months before we bring home a newborn. She gave us the confidence we needed that we really did know more about training, crating, and raising a puppy than we thought we did and realized that this is probably the last time in the next 20 years that we would have 6 whole months to devote only to a puppy. We left her house with an empty wallet but the very happy realization that we would be bringing home a goldendoodle in less than a week. The following week seemed to drag on but we knew we would have Saturday to look forward to when we could finally pick him up and bring him home. I also had an Emily Weddings retreat weekend to look forward to! There are nine ladies on our team and to organize a retreat where ALL of us can attend is nearly impossible and therefore we have never been able to plan one. So we finally just bit the bullet and planned it. Unfortunately, a few of us were out of town, others had baby showers and bridal showers, and one came down with the flu just days before the trip… and then there were four. We had all these plans to complete a few big projects while we were there; however, dinner at a gourmet restaurant, a few bottles of wine, and a new bottle of Patron (thanks to the boss lady) sounded like a much better plan and we didn’t get nearly as much done as we had hoped. Even in spite of our non-productiveness, we were able to spend valuable time together catching up, talking about the local wedding news, and about our upcoming brides. By Saturday morning, no one wanted to leave but unfortunately we had life waiting for us back and home and I had a puppy to pick up! When Blake and I arrived at the breeder’s house out in Blackwater we were greeted by a near empty house (most everyone had already picked up their puppies earlier in the weekend) but we could hear our little guy barking from the basement. He was a little hesitant to get in the car with us as he had probably never ridden in a car before but I held him and he cuddled up to me the whole way home. When we got home we spent the rest of the night playing with the newest addition to our family, showing him his new toys, teaching him how to play with a ball and chew on his toys (and not our furniture, baskets, clothes, etc.) He must be the best puppy on earth because he quickly learned what not to chew and would walk right over our phones, computer cords, and anything else we had laying out that he was not supposed to chew on. Thanks for checking in and keeping up with the weekly Baby Roberson updates. We’ll try to keep them up each week and hopefully I’ll have a bump to show off soon!